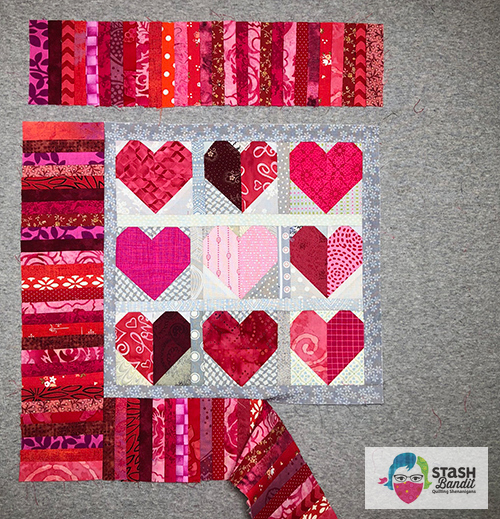 Last year I tried a couple of different ideas as I was developing my free heart quilt pattern. A few of them didn’t make the cut for different reasons, and this was one of the rejects. When I pulled it out this week, I felt like I could salvage it. When I got to the borders, I used a partial seam. A partial seam is used when something needs to be set into the middle of some patchwork; it’s a way to avoid a set-in seam, also know as a y-seam. If you look at the quilt above, try to imagine how you’d attach the borders. Do you see the problem? If you don’t it’s okay. Let’s move on to how a partial seam works. 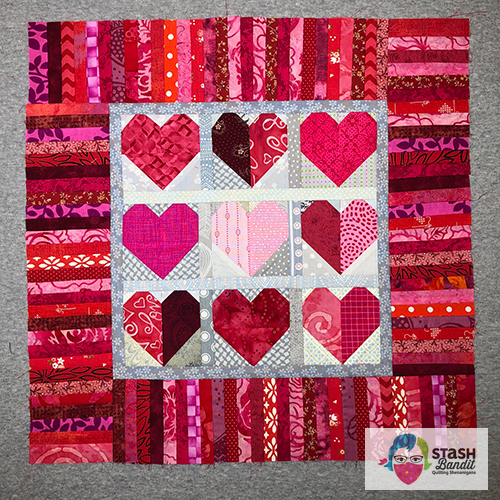 The first thing is to attach one border about halfway across the quilt center. Leave the rest to dangle as shown above. Press the seam. This sets you up to attach the next border which is lined up below. 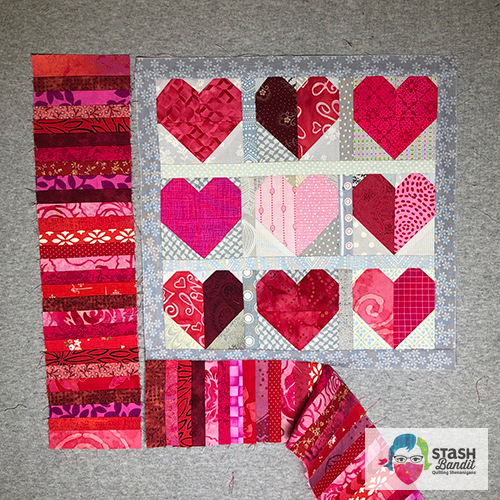 You can see that each border strip needs to be as long as the quilt center plus the width of the border. 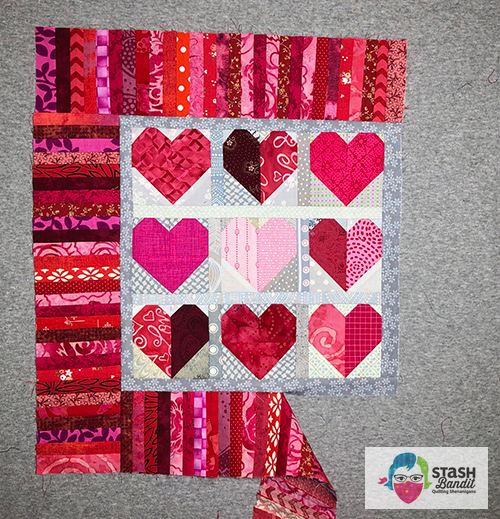 Attach a border to the left-hand side of the quilt center as shown below. Press the seam. This sets you up to attach the third one to the top of the quilt. In the photo below, the top border is shown lined up next to the top of the quilt center. 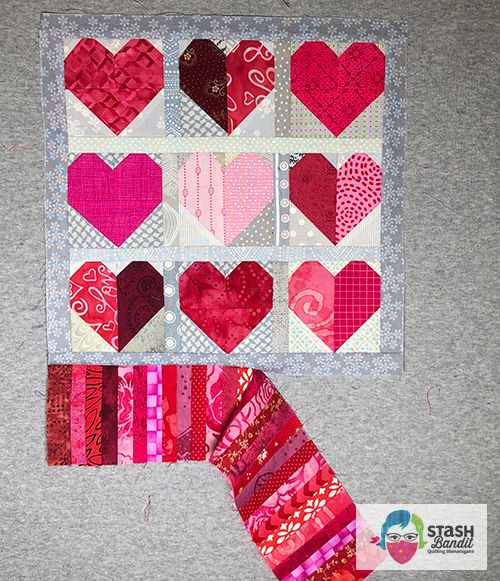 Attach a border to the top of the quilt as shown below. Press the seam. This sets you up to add the fourth one. The first one you added just dangles there as you do these steps. Don’t worry about it yet. 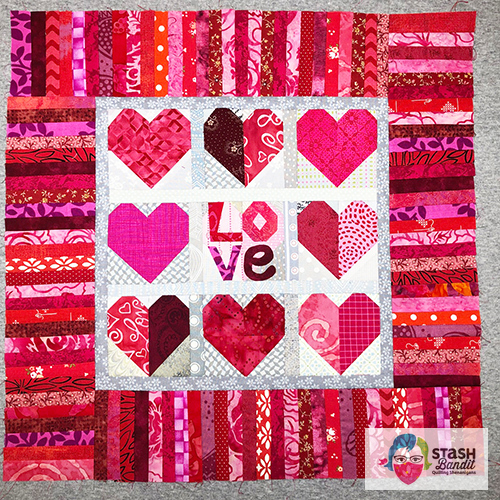 Add the last border to the right-hand side of the quilt as shown below. Press the seam. This sets you up to finish the partial seam. Fold the dangling border up so it’s right sides together with the quilt center. Beginning from the outside raw edges at the right-hand side of the quilt, finish the partial seam to attach the dangling portion to the quilt center. 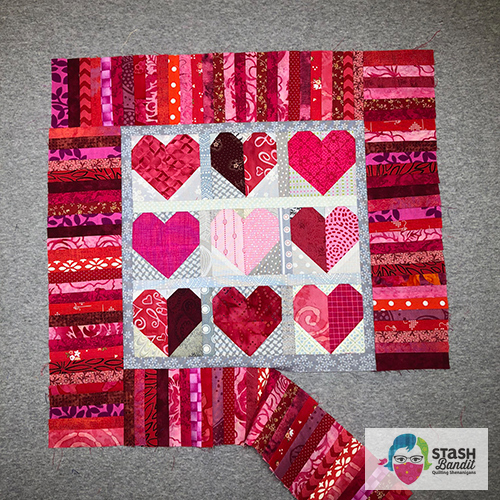 If you’re an experienced quilter, you may have noticed that these pieced borders could actually be added without a partial seam. But since the border piecing was already done, I didn’t want to disassemble them to do that! A partial seam was the perfect solution. Next up: How I fixed another problem on this little quilt. 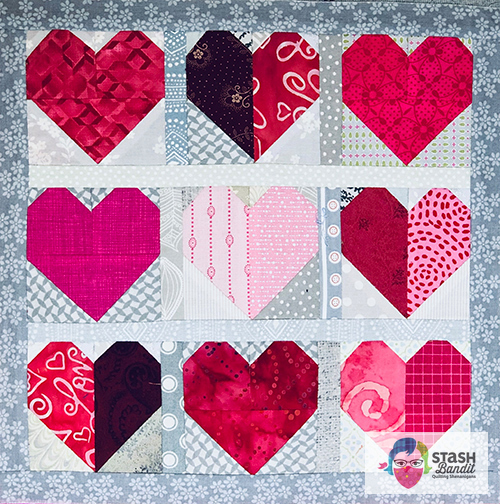 Get the free pattern for my little heart quilt! Thanks for visiting Stash Bandit. Have a great day! Given that the borders are strip pieced, why didn’t you just make your borders the same length as the quilt top, attach at the sides, then make strip pieced corner stones and attach them to the top and bottom borders, then sew the top and bottom borders to the quilt? Seems like that would be easier. If the borders were made of a solid piece of fabric, then the partial seam method would be the only way to go. Hi Beth, you’re absolutely right, and if you read the whole post, you’ll see I mentioned that it could certainly be done that way. Perhaps solid borders would have made for a better example but this was on my work table today. Thanks for visiting. Happy Quilting! Generally I m not a big fan of the color gray, but here the gray fabrics are a lovely contrast with the pink and red heart fabrics–so very pretty! Just found you. I love how this birder makes the little piece pop! Love it! Actually partial seams aren’t that difficult once do one or two, always a great option and tool to have in our box. Welcome, Marty! You’re right, they’re easy as pie but for some reason people are afraid of them. Thanks for visiting and leaving me your thoughts. Come again soon!